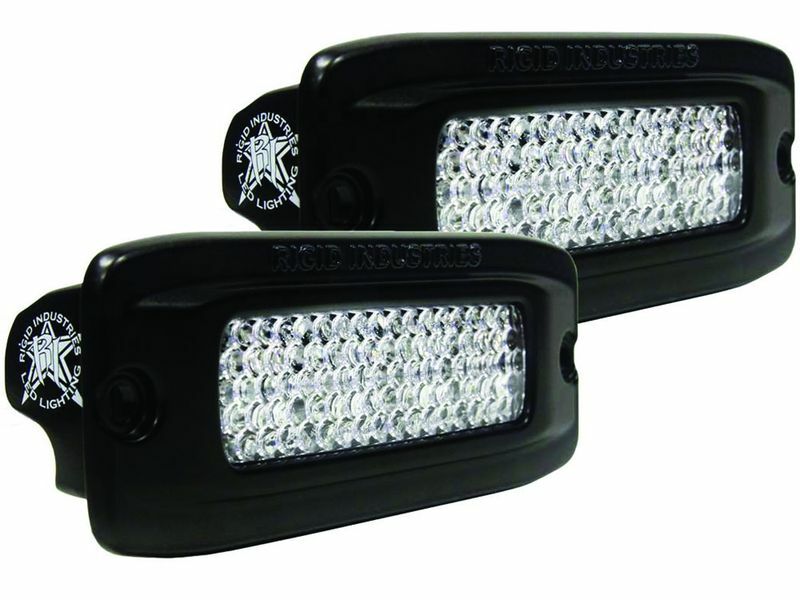 RIGID SR-Q PRO flush mount LED back-up lights are versatile and can be used on any application. The SR-Q utilizes the same technology as the D-series, but it features a wider configuration. Its compact design allows it to fit almost anywhere. RIGID constructed the SR-Q lights from cast aluminum and uses polycarbonate lenses to keep out the elements. RIGID equipped these lights with their patented Hybrid optics and paired them with a diffusion lens. This lens was specifically engineered to project light at a 60° flood pattern. RIGID SR-Q lights also feature a GORE® pressure equalizing vent and a thermal management system to help keep these lights running cool for up to 50,000+ hours. Order your RIGID SR-Q PRO flush mount LED back-up lights and install them with the included extended 25' wiring harness and installation hardware. Know exactly where you're backing up your vehicle with RIGID SR-Q back-up lights. If the product was purchased from an authorized RIGID reseller, the product should be returned to that reseller if less than 60-days from purchase date. If it has been longer than 60-days from purchase date, please review the following and contact RIGID directly. If the item was purchased from RIGID directly, please review the following and contact RIGID. RIGID is not liable for any charges incurred by the Customer relating to installation, repair or removal of RIGID product offerings. RIGID warrants that this product will be free from defects in material and workmanship. If you believe your RIGID product is defective, it must be returned to RIGID for inspection by our warranty claims department. After inspection, RIGID will verify that the defect was not caused by negligence, abuse, unauthorized repair or disassembly, RIGID will determine whether the product will be repaired or replaced in accordance with RIGID Limited Lifetime Warranty*. If RIGID determines, in its sole discretion, that your product is defective in material or workmanship, RIGID will honor your warranty claim. In some cases the product will replaced, depending on the specific timeframe of the purchase. If the product is repaired, all parts, labor, and return shipping may be covered by RIGID. 2 year limited warranty – All products with powder coat/finish wear (RIGID uses the highest quality materials available. Depending on environment, powder coat can fade). Additional 2 year limited warranty products include accessories, covers, mounting options, kits (excluding light, see limited lifetime warranty), and all other items that RIGID offers as part of a closeout or discontinued sale. 1 year limited warranty – UWL (Under Water/Wake Flame) Series of lights, Interior Dome Lights, Halo Flashlights, flashlight accessories, Reflect housing, Reflect body, and Reflect Clamp. 1 Negligence: Improper installation, improper use, etc. 2 Abuse: Road hazards, Damage beyond the limits of "normal wear and tear." 3 Unauthorized Repair: Repair service performed by an unauthorized service center. 4 Seal Tampering: Removal of bezel or bezel screws will compromise the integrity of the water-tight seal. Without registering your purchase or having your original proof of purchase available, the RIGID Limited Lifetime Warranty could be voided. No RIGID Limited Lifetime Warranty is available for the Capture series of lights until a warranty registration is received from the end user and approved by RIGID. All warranties are non-transferable. Warranty terms and policies are subject to change without notice. Install your RIGID SR-Q PRO flush mount LED back-up lights with the extended 25’ wiring harness and installation hardware.